The Golden Circle Day Trip from Reykjavik is a must if you are visiting Iceland. The Golden Circle classic tour includes a visit to some of Iceland’s most beautiful natural wonders including geysers, waterfalls, geothermal areas and a National Park. You can take this tour with one of the large outfitters in one of the big tour buses where you are on a tight time schedule and herded from spot to spot. Or you can take the tour in a smaller group with a flexible schedule that also includes a visit to Laugarvatn Lake and one of Iceland’s geothermal pool’s called the Secret Lagoon. When my son and I visited Reykjavík, we opted for the The Golden Circle with Secret Lagoon tour with Iceland Premium Tours also known as the Hot Golden Circle Tour. If you enjoy a smaller and more intimate experience this is a wonderful tour. There are a maximum of 19 people on this Iceland Premium Tour. The bus stops more often than the large buses and you’ll be able to stay longer in areas and even make unexpected fun stops such as ice cream at a dairy farm. Iceland Premium Tours picked up everyone on the tour from their different hotels and we were quickly on our way out of Reykjavík. As we headed out of Iceland’s largest and most populated city, we glimpsed beautiful views of the Reykjavík harbor and Videy Island, situated in Kollfjörður just off the coast. The Golden Circle route is located in southern Iceland, covering about 300 kilometers looping from Reykjavík into the southern uplands of Iceland and back. It is the area that contains most tours and travel-related activities in Iceland. Our guide began filling us in on the history of Iceland including how the country was settled, it’s odd laws, some of the top bands that have come from Iceland and many more fun and odd facts. The guide shared so many great facts, I’ve included this in a separate article where you can learn 20 Things You Don’t Know About Iceland. Our first stop on the tour was a visit to Þingvellir (Thingvellir) National Park also know as the Parliament. 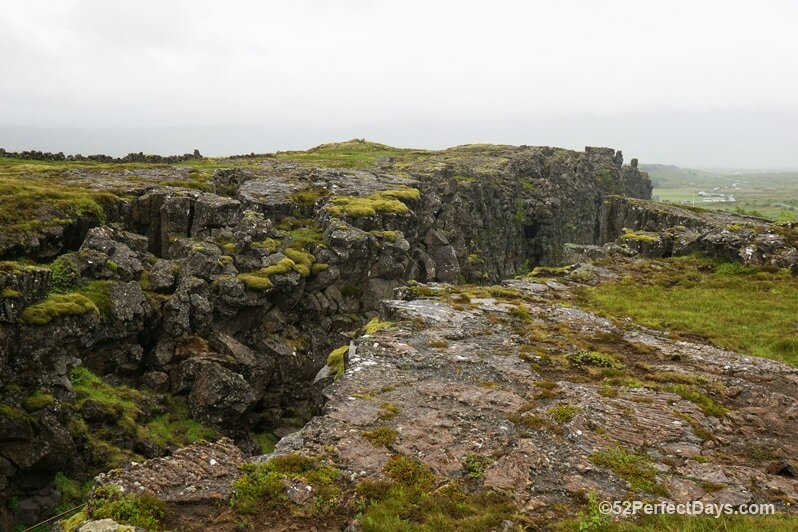 This historic and geological wonder is where the American and Eurasian tectonic plates are pulling apart at a rate of a few centimeters per year. Thingvellir National Park is the largest attraction of the Golden Circle and it is really fascinating to think you are on two continents; North America and Europe. At the site below (Althing) the world’s first parliament was established in the year 930 and continued to meet until 1798. Chiefs from all over Iceland met here each year to discuss law and government. 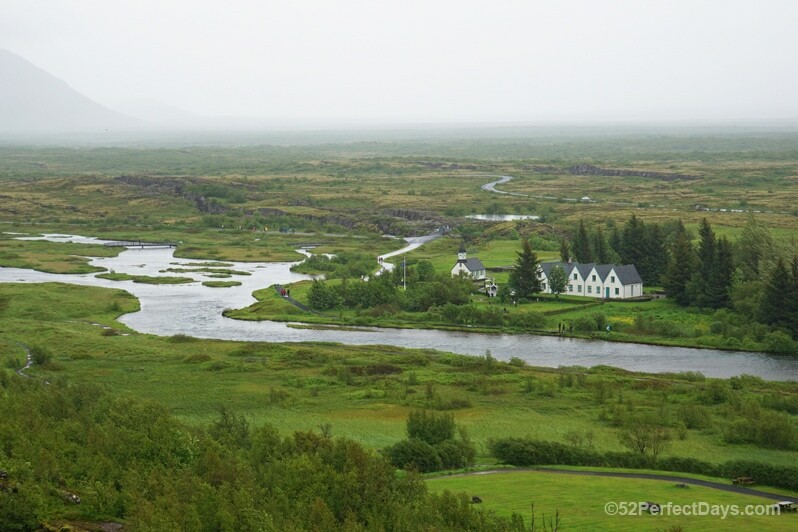 Today, Þingvellir is a UNESCO World Heritage site and the most important cultural heritage site in Iceland. 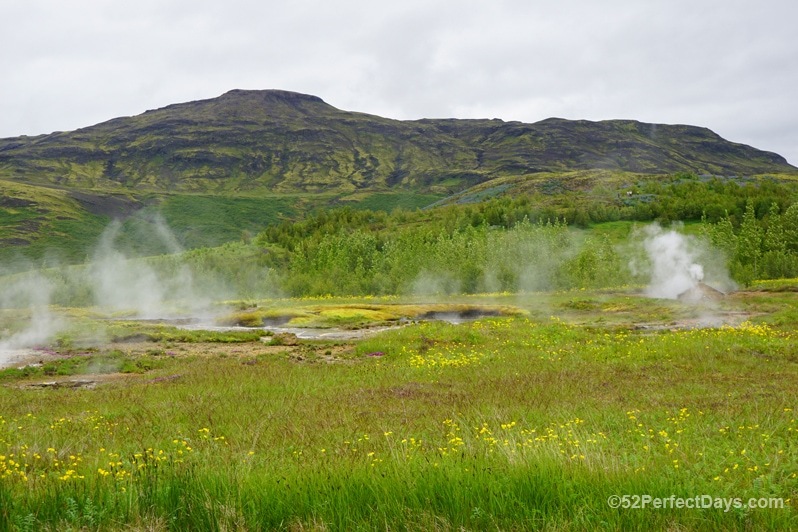 The geothermal area in Haukadalur, contains the geysers Geysir and Strokkur and was our second stop on the tour. Though Geysir has been mostly dormant for many years, Strokkur continues to erupt. The geyser Strokkur shoots a column of water up to 30 meters (98 feet) into the air every 4-8 minutes. Strokkur is also the most active geyser in Iceland. My best footage of Haukadalur was video and to get the best feel for Haukadalur and the entire Hot Golden Circle Tour, click the arrow on the video below. Haukadalur was also our lunch spot. There are several restaurants to choose from including a cafeteria as well as a sit down restaurant. 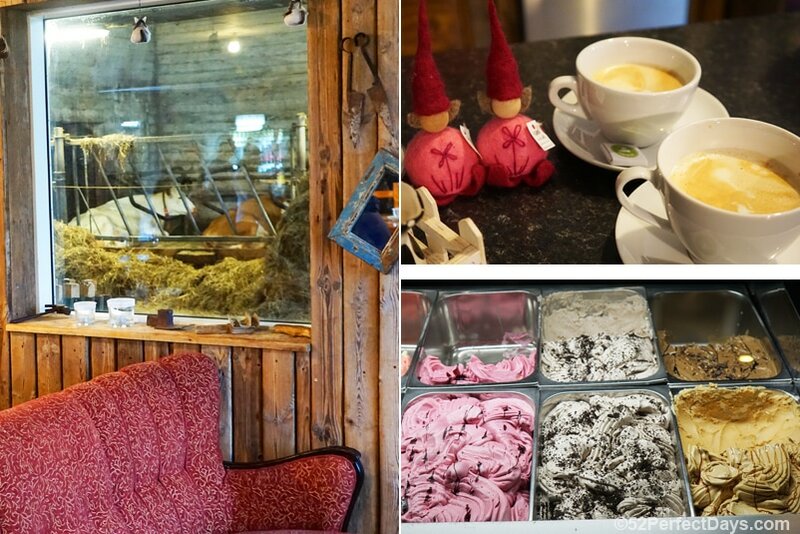 Our third stop on the tour was a working dairy farm that had a quaint cafe where we could enjoy coffee or ice cream. From inside the cafe there were windows where we could see the cows and barn. Such a great concept! Our fourth stop on the tour was Gullfoss, the queen of Icelandic waterfalls, is a step waterfall, created by the glacial river Hvítá. It tumbles and plunges into a crevice some 32 m (105 feet) deep. At Gullfoss we were able to view the falls from parking lot area, or take a hike down to get closer to the waterfall. Definitely worth the hike down to get a real sense of the power of the falls and depth the water is falling. Our last stop on the tour was the Secret Lagoon. The lagoon is not as much of a secret as it once was, but it’s wonderful chance to experience Iceland’s natural hot springs. Created in 1891, this geothermal pool with a spouting geyser is a much quieter alternative to the infamous Blue Lagoon. When you arrive, you head to the men’s or women’s locker room. They require you to shower prior to entering the lagoon. 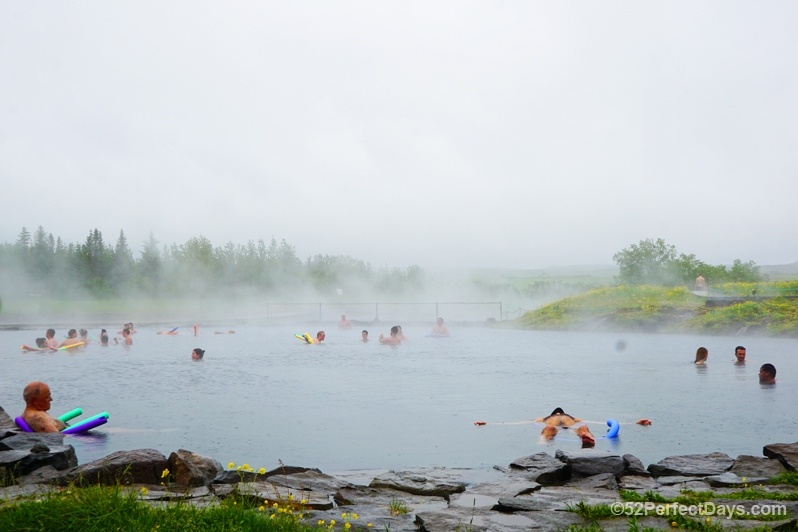 Then stop by the bar to pick up a soda, water or Icelandic beer and enjoy the healing power of the natural hot springs. During our tour we had a bit over an hour at the lagoon. A perfect amount of time to relax and enjoy the warm water. When you are in Reykjavik Iceland a visit to the famous Golden Circle is an one-day trip you should not miss. The Hot Golden Circle tour is a must-see. The tour is about eight hours and a great way to see the beauty of Iceland. 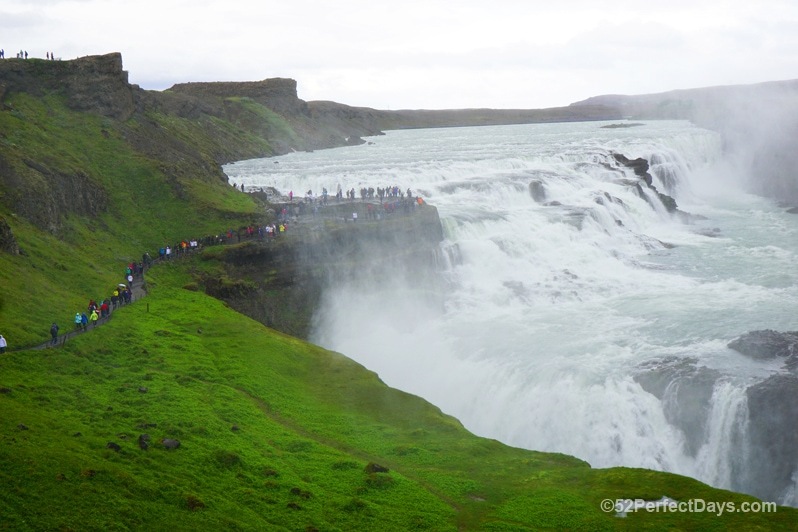 The Golden Circle tour is a bit touristy, but most places that are magnificent and beautiful tend to be! If you enjoyed this article about the Iceland Hot Golden Circle Tour, you’ll also love How to Book Cheap Flights to Iceland with WOW Air. How to get there: Iceland is just a 4-hour flight from the East Coast of the US, an 8-hour flight from the West Coast of the US and about 3 hours from the UK. There are multiple airlines that fly there, with Iceland Air and WOW Air being two of the most popular (and often the most affordable). I recommend WOW Air as I have flown with them to both Iceland and Ireland. Where to stay: Reykjavik is a great base for an Iceland vacation. I recommend Hotel Odinsve, it’s a great location in the city center, but located on a very quiet street. The hotel rate includes a wonderful breakfast as well. I suggest checking HotelsCombined for the best Iceland hotel rates. What to pack: The temperatures each season vary greatly, but even in summer it can be cold. I visited in June and the high was 68 °F (20 °C ). Heading out of Reykjavik for the Golden Circle Tour, it was must cooler. I was very happy I brought along fleece lined leggings, a light down jacket, warm socks (I love Ice Breaker), a waterproof outer layer and rain jacket, and some hiking boots (I love Keen). If you are visiting in Winter, you’ll want to bring heavy duty layers. Check out my complete Iceland packing list for more suggestions! Pick up the Lonely Planet guide to Iceland or the Lonely Planet Pocket Guide to Reykjavik. Get a good quality mirrorless camera for getting amazing photos of the many beautiful sites in Iceland. I use the Sony Alpha a6000 . Waterproof hiking boots are a must. I love Keen because they are lightweight and super comfortable. While I was an invited guests of Iceland Premium Tours, this is a totally independent and honest review based on my experience. The Golden Circle with Secret Lagoon tour sounds like a perfect choice for someone like me who doesn’t like to be rushed. Great tips Alexa on what to pack. Iceland is a country that I am dying to visit, but would love to do an independent road trip exploring it at my own pace.